Dear students, Today is the second day and first shift of SSC Constable GD Exam. The Exam will be conducted by TCS from 11th Feb to 11th March 2019. 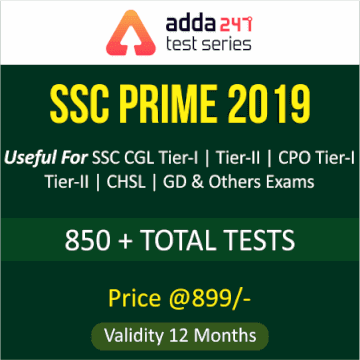 We are providing Exam analysis of SSC Constable GD Exam 2019, so that all other aspirants can get an overall and clear idea about exam pattern and difficulty level. The SSC Constable GD Exam 2018-19 is being held in online mode. So dear students, without much ado, let’s get straight to the detailed Exam analysis. The Computer-Based Exam will be of 100 marks. The time of 90 minutes will be given to the candidates. There will be four sections in the examination– GK , Reasoning , Mathematics and English/Hindi. Computer Based Examination will be held in English & Hindi only. In SSC GD Constable Exam 2018-19 the questions of General Intelligence(Reasoning) were quite easy. Students can have a fair idea of what SSC had been upto in terms of these questions. As per the inputs shared by students, this was the easiest among all the other sections. Questions from series & missing term were quite moderate. No question asked from counting of figure in this shift. English Language section again surprised candidates with 5 questions from instead of Cloze Test. Questions from Antonyms & Synonyms were moderate. Quant in SSC GD Constable Exam 2018-19 exam was of easy-moderate level. In this shift, Questions were no questions from Co-ordinate geometry. 3 Questions from tabular DI were asked. There were 5 questions of SI & CI and Profit and Loss. In SSC GD Constable Exam 2018-19, General Awareness questions were asked from all aspects of GA. In this shift, exam was moderate. Maximum questions were from History (4-5) which are from ancient history, Polity (4) and Science (6-7 questions). Which of the following wicket keeper took the most number of catches? Youngest person to get the Khel Ratan Award. Where is Hawa Mahal situated? Which of the following is the most ductile element? Which of the following element will react with water? Which player has the record of the most number of goals from the Indian Football Team? Who is Indian Sports Minister? Jammu & Kashmir comes under which article? Where is Lathmaar holi played?